Chubby baby cheeks, a warm beverage on a cold day, giggles that have a mind of their own, a hike in the woods, fresh air, petting my labradoodle, eating at a restaurant who cleans up after me, and a day with zero things on the calendar…these are just a few things which make my heart glad. Then, life comes in and gladness zips away. I feel like I could almost catch it as it whips out the window, on a cold winter’s day, but instead, the sensation of contentment and happiness I associate with gladness, with big, bold smiles, and swelling heartstrings is a lightening flash, here and gone. God’s gladness is different. When God gives gladness, through His Word and through His Spirit, it stays. It can grow, expand, and swell among us, but it’s going nowhere any time soon. It’s here…for, well, eternity. Even more worthy of all gladness is to know what makes God glad. Not in temples made from human hands…but He chooses to dwell in you and in me. God isn’t contained by us, but He is glad to reside in us. He brings His streams of living water to us in baptism, and the Spirit rushes in. So, you. You make God glad. Put those things together with a whole body of souls and faces jumping into the invitation to be in relationship with Him and wow – there we have it – the People of God, the City of God. Want to hear more on this great, big theological ball of gladness? 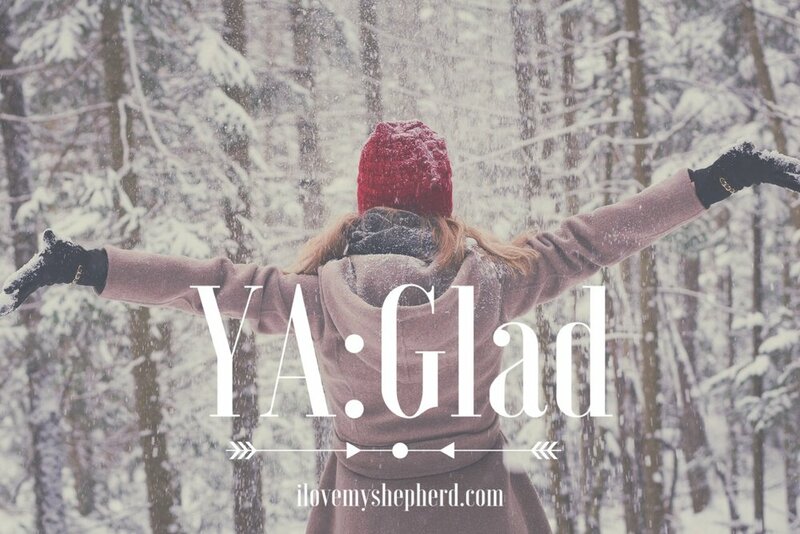 Check out the latest episode of our podcast, part of our YA series on Psalm 46 - YA: Glad. Find all the episodes of the Psalm 46 series on our YA page. When I was a little girl, I liked to create festive fun at the drop of a hat. Looking back, my parents were outstandingly good sports about this. As an adult now, I don’t know that I would exhibit the same patience if one of my kids demanded so much energy in an already busy holiday schedule. One of my favorite ways to pep up any mundane errand during the holiday season as a child was to enact Operation Acapella Carols. Whenever we hopped in the car, I began the Collection of Requests. Once everyone had proven awareness of the task at hand by either giving their carol request, deeply sighing, or grunting in consternation, the festivity could begin. My job was to declare the Chosen Carol, then the family sing-a-long could begin. I’m sure there were moments it was annoying, for my parents, my siblings, myself. I’m sure there were moments when people argued and complained and pulled hair and other things kids do because cars are like giant sweatbox saunas for emotions, boredom, and personal space issues. All it took to create a new carol request, was a lawn ornament siting, a giant blow up, or the awe brought on by dancing twinkling Christmas lights only children experience, or we all experience when we let ourselves think like a child for two seconds. In our family, there were difficult Christmases, lonely Christmases, and wonderful Christmases, but the carols stayed constant, a reminder that God’s Joy in Jesus was not dependent on life’s happenings, but only on the One who gives the Greatest Gift. Those Christmas carols, the hunting and finding of various Christmas treasures across lawns, town squares, and church yards, spoke grace to me. It reminded me He was present, not just in the manger long ago, but in my here and now. These things are very, very small, Christmas lights, carols, and fogged up car windows, but in a child’s world, and in my adult world, they serve as a reminder that He was there, when the world flickers from dark to light and back again, always changing, mostly confusing that young girl still inside me. When I became a youth leader, I wanted each of my youth to experience this grace in an evening of silliness, connecting in a too hot minivan, laughing, and poking at one another to see the Joy and see the richness God offers us in his gifts and one another at Christmastime. And so the Christmas Light Scavenger Hunt was born. I invite you to bring some joy and grace into your family, your youth group, your church, your vehicle, your friendships this holiday season. Bundle up, prepare to poke and giggle and be silly. Jump in the car and out of the car. Finish well with some cocoa and cookies or cheese and grapes. Stop by and cookie bomb someone, or leave an ornament and note on someone’s doorknob. Connect, gather, and make some general merriment. Download our Scavenger hunt image to your phone, or click on the button to get to our free printable version. May our Christmas Light Scavenger Hunt bring some extra grace, some extra relationship into your holiday season, as you welcome the Baby Boy who heals and restores our days, our relationships, our families, and our Forevermores. Share with us in the comments your own experience with our Christmas Light Scavenger Hunt or any fun holiday memory which brought some grace and relationship into your life. Sign up to receive I Love My Shepherd by email.